If you start your day with a cup of coffee or simply an occasional coffee drinker, this espresso machine is definitely for you. Brewing your favorite coffee is no longer a time-consuming task than before. You don’t need to be a barista or a good brewer too. The machine will do the wonders for you. 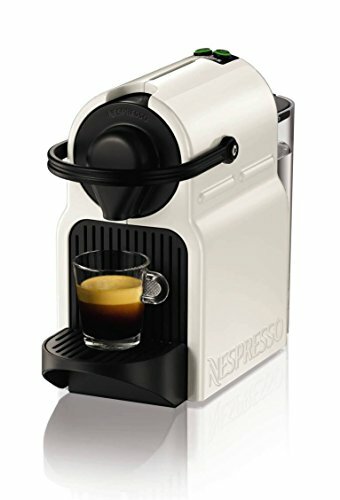 Nespresso Krups Inissia: With 19 bar pressure, the Inissia, ensures excellent extraction and gives you an espresso cup full of flavor and rich crema to keep your taste buds tingling and love for espresso’s growing. 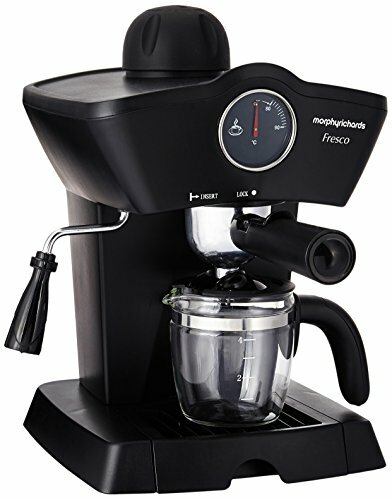 Morphy Richards Fresco: Not just espresso, with this you can also make cappuccino, latte or black coffee which makes it ideal for home and office use. If you are looking for an espresso machine that delivers flavourful and aromatic espresso just like your favorite barista, this capsule-based espresso maker is just what you are looking for. The patented extraction system that can deliver around 19 bar pressure is what makes your espresso’s so flavourful and barista-like. And you do not even have to wait for the water to heat as the pre-heat system takes no more than 25-30 seconds to bring the water to the optimum temperature. Once heated, just hit the Espresso or Lungo button and you will have your favorite coffee ready in under a minute (told you, its fast). The capsules are easy to install even for newbies while the container can store about 9-10 capsules at a time. And if you love free stuff (c’mon, we all do), you will be happy to know that you get 16 capsules free with the purchase. There is 24ounce water tank which is pretty straightforward to clean as it can be removed easily. Further, any drips and spills won’t cause you a headache as they slip down into the drip tray which only needs to be cleaned after several brews. Also, the foldable cup holder allows you to set up a cup of any size. The Inissia comes with an A Class energy rating so you know it will not hike up those electricity bells but if that wasn’t enough, the machine also auto-shuts off after 9-minutes of inactivity (perfect for the forgetful you). There is no milk frother with the Inissia so that is something you will need to buy separately. Also, you can only be using Nespresso pods but there are plenty of flavors to cover everyone’s taste. The Morphy Richards Fesco is the ultimate family coffee maker designed to suit everybody’s taste buds. Simply put, this one is a must buy and here is why. Do you like your coffee black? Or is it a hot cup latte or cappuccino that gets you up and running early morning? Luckily, there is nothing this baby can’t make. And if there is no bed of froth on top in the cappuccino or latte, are you even drinking it right? Well, that is where Turbo Cappuccino Nozzle wields its magic (enjoy Costa Coffee or Starbucks like coffee right in the comfort of your home). You also have the flexibility of choosing between medium or strong coffee using the strength selector. There is also the temperature dial gives you exact readings to eliminate any guesswork and helps you get the perfect texture. Lastly, 800-watt motor is powerful enough to deliver a quick brew so you do not have to wait for the coffee too long with little impact on energy consumption. The heat resistant glass carafe can hold coffee for 4 and comes with measurement markings so you can pour precise amounts. And in case you do spill some coffee while pouring, it all gets collected into the removable drip tray so cleaning it should take no more than a few minutes. To rev up your senses with and give you a delightfully smooth, silky textured coffee each time, the Fresco has been equipped with stainless steel filters. This also makes them rust-resistant and easy to clean so you do not have to spend a rupee on buying additional filters. With the overheat protector, your coffee will never overheat. And in case you any trouble with the coffee maker, the 2-year Warranty should come in handy. Well, the only small issue with the coffee maker is that the carafe does not come with a warming plate. So if you leave the coffee for too long it can go cold very soon especially if you live colder parts of India like Delhi, Shimla etc. Considering its larger capacity and brewing capabilities, the Fresco makes for a top-notch coffee maker for both homes and offices in India. If you live life on the go but cannot compromise with your early morning cup of joe, this one of a kind next-gen coffee maker is sure to blow your mind away. Did you know that you can now make coffee with the press of a button via your mobile? Sounds crazy? 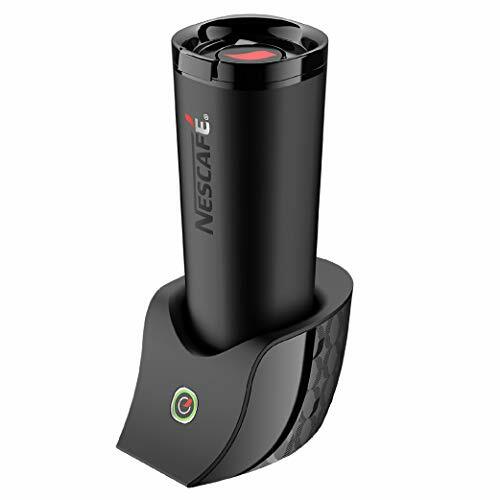 Just pair your E Coffee Maker to the Nescafé É Connected Mug App and see the magic happen. Through this app, you also get access to tons of recipes as well. So whether you like your coffee cold, a latte, cappuccino or black, select the recipe, hit the button and voila, you will have your coffee ready in just 60-90 seconds with minimal noise. There is also a memory function that saves your favorite recipes for quick access and brewing (especially useful on lazy Sunday mornings). And since the mug has a double-walled stainless steel thermal insulation, your coffee will stay warm and hot all day long, even during the chill of December. Forget the long instruction manual you got. Cleaning is just as easy as using the coffee maker. Just throw in some mild detergent and water into the mug, hit the cleaning mode through the app settings and once done give the inside a rinse. As far as the outside, a wipe with a damp cloth should suffice. If you have your creative juices flowing and think you may just have discovered the next big coffee recipe, you can save it and share with your fellow Nescafé É buddies. That’s is right. The app helps you connect with serious coffee aficionados and allows you can share your recipes, coffee stories etc. (because the best bonds in life, mostly happen over a cup of coffee). The Bluetooth connectivity strength may vary from mobile to mobile so make sure you do a test run before buying one. Also, it brews coffee only for 1-2 people and thus not the ideal coffee maker is you are entertaining a crowd. Drawbacks aside, if you have your travel mode on, this by far the best espresso maker in India for you and thus worth its price. Apart from allowing you to prepare your own coffee how you like it, there are other superior benefits of owning an espresso machine at home. There’s nothing better than having your family or friends over for a meal and then finishing off with a delicate beverage such as espresso. You can have your own cup of espresso anytime. No more long travel hours and spending extra bucks for a single cup of your favorite espresso. With the right machine, lukewarm water, right coffee, you can always have a homemade blend. Thanks to the aroma of espresso, it can make you livelier as you begin your day off after work. It is actually complex and delicate preparing an espresso. The process includes forcing hot water with tightly ground and packed coffee. With your own espresso maker, you can prepare some according to your own taste. When it comes to morning coffee, daily, and entertaining life, an espresso machine offers benefits as it gives you more options. You can make a latte if that’s what your palate craves for. With so many options to choose from, there are still a lot of things to consider before lending your hard-earned dollars. What else to look for an espresso machine? Is the machine prominently made of plastic or stainless steel? Have other sources of construction in mind? Usually, a costly product uses high-quality materials. Capacity is determined by the boiler size and number of group heads. Most espresso machines have 2 to 4 group heads and can make up to 8 drinks altogether. Check also the number of beans your potential machine can be able to store. For big families, an espresso device with huge storage capacity is typically ideal. Look for the machine drip tray as well. Is it large enough? There are several variables. Ensure to think about your needs before purchasing. Some machines pour water while others connect to a water source. Other factors like water rerouting and space could find out which unit would greatly work for a specific environment. As much as possible, look for an espresso maker with features such as containers with measuring marks, water tank storages, and removable drip trays. When it comes to grinding, you have 2 option. Either get a separate grinder or built-in grinder. The latter is the most convenient. This excellent feature is decently determined by the type of brewed specialty coffee. Frothing capabilities is specifically essential if you want to brew Americanos, macchiato, and cappuccinos. But if it is black coffee you purely love, then this feature might not be included in your list. Most automatic espresso machines are self-cleaning, though they should be descaled on a regular basis. Look for a durable machine so in the event a certain issue arises, repairing is just easy. Following is a quick breakdown of types of espresso machines. Some of these kinds would surely be a better option than others depending upon your taste. Ideal for those looking for a traditional espresso maker, the manual machine is relatively simple mechanically and often constructed with old-world beauty, processes, and quality. Although, it can be complex to use, requiring research, patience, and practice. But once you master it, you will get one of the best brewing experiences. The most common type which features an electric brewing pump. While easy to operate, a semi-automatic espresso unit demands the most manual involvement. Little counter space is typically required. Some newer models are compact-sized. By the word itself “automatic”, dare to enjoy one or two cups of coffee a day with less effort on your part. This machine does all the work on your behalf, hence, more convenient. Fully automatic espresso machines are expensive, though. When it comes to utmost convenience, the capsule espresso machine is the name. It perfectly fits households, offices, and foodservice operations such as restaurants. Enjoy a thick and rich espresso. A very rare type of espresso machine that requires a lot of manual effort. You might find it exhausting to use and would need some time to become accustomed to. But in spite of these things, lever/piston machines allow you to adjust the taste as per your preference. A convenient version of lever/piston. Pump-driven is a great choice for people who enjoy their espresso and the whole process of producing the shot. It is a highly powerful espresso maker with pressure levels that are 5 times higher than other forms. Ideal for those with a restricted But since the price is reduced, you should also expect less performance compared to other kinds of espresso machines. So, now you know what to look out for. The final choice still depends on your requirements, personal preferences, and budget.